Idaho Fish and Game is seeking public comment on proposed changes to the upcoming migratory game bird seasons, including waterfowl, mourning dove, American crow and sandhill crane. People can review proposals and comment online at Fish and Game’s public involvement page. Hunters can also visit regional offices for copies of the proposed seasons and comment forms. Snow geese’s unique migration allows a different hunting opportunity in Idaho. The spring “light goose” season, which includes blue, snow and Ross’ geese, is a relatively new opportunity for hunters. Teton and Fremont counties are open for light goose hunting, which include blue, ross’ and snow geese. Up to 60,000 snow geese, white-fronted geese and other waterfowl use the Fort Boise WMA as a stop over on their northern flights. 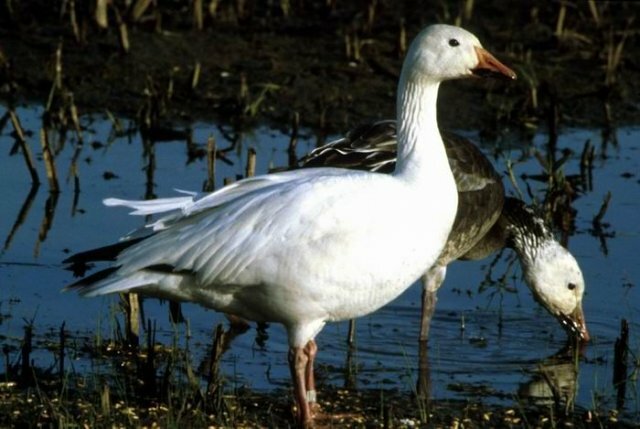 In mid-March, approximately 335 migrating snow and Ross's geese were found dead over a period of several days at Mud Lake and Market Lake Wildlife Management Areas in eastern Idaho. This is the second consecutive year a die-off has occurred in the area. Tens of thousands of snow and Ross's geese migrate through Idaho every spring on their way to their nesting grounds in the artic. While unfortunate, the deaths of a few hundred geese will have no impact on the overall health of the populations, which collectively exceed 2 million birds. Avian cholera is a contagious bacterial disease caused by Pasteurella multocida. The primary means of the infection is exposure to dead birds. P. multocida can linger for several weeks in water and wetlands where affected birds have died. Scavengers can also spread the disease further by tearing open carcasses, and releasing more bacteria from the carcass into the environment. Avian cholera can be found throughout North America and has been documented in waterfowl in Idaho. Avian cholera can occur year-round, but is more apt to occur during spring migration. Sick birds are rarely seen because the disease is usually rapidly fatal. Sick birds can show signs of sluggish behavior, drowsiness, loss of fear of people, erratic flight, or flying into the ground or water. Some affected birds have mucous coming from the nose and mouth, and yellow or blood stained feces. Because they are so sick, captured birds often die within a few minutes. Because birds die quickly, they often have no lesions on the organs. If the bird has been infected for a while it may have small white to yellow spots on the liver and red spots on the heart and possibly the gizzard.